blog Archives - Rob's Forklift Repair Inc. When working at heights in maintenance and construction, you need ways to work at various heights with ease. Scissor lifts and Aerial boom lifts are essential pieces of equipment for working at heights. First lets talk about scissor lifts, these machines are known as an AWP, Aerial Work Platform. They are a work platform mounted on folding arms that elongate as the platform is raised. These movable work platforms are used for elevating personal and any tools or equipment they may need for the job at hand, but are limited to just up and down movement of the work platform. Scissor lifts come in a variety of different sizes and types. These lifts can be used for situations that require work at various heights, and in most cases are safer than ladders and scaffolding. Next lets talk about the Aerial Boom Lifts, like Scissor Lifts they are designed to take workers to elevated heights, but these machines are more versatile and can take workers to greater heights with more maneuverability. You will often see them used on various construction sites. There are different types of Aerial boom lifts and what they are used for. Articulating Boom Lifts…are referred to as a knuckle boom lift. These machines are designed to articulate for reaching up and over obstacles and have great features. They are drive-able at full elevation, have a 360 degree rotation ability and there width is narrow, allowing them to get in narrow spaces. Telescopic Boom Lifts are known as straight or stick type of boom lifts. If you are required to reach high places, this is what you want to use. Unlike the articulating boom lift, it is not designed to for reaching over obstacles. they can rotate 360 degrees and maneuver in any direction. Just like Forklifts, operators of Arial Boom Lifts and Scissor Lifts are required to attend and pass a operator training program. We offer this training onsite/site specific all across the lower mainland for individuals and groups. We have officially opened a Forklift Parts division at Robs Forklift Repair in Maple Ridge. Think its safe to say that we are now your one stop shop for everything Forklift, from repairs , rentals/sales, operator training and now Forklift parts. We now carry OEM and after market parts for most Forklift makes and models with same day availability on common parts and attachments. If we don’t have it on hand we can get it for you quickly. What are the Parts of a Forklift that need to be replaced regularly? FORKLIFT BRAKES AND TIRES Forklifts are heavy machines and put a lot of stress on the brakes and tires, this can result in extreme wear over time. If you start to hear unusual sounds or see obvious visual signs of wear and tear it may be time for new parts. The brakes and tires are something you want replace as soon as you notice something wrong as sudden problems can result in serious damage or injury. FORKLIFT AIR AND OIL FILTERS Just like your vehicle, these need to be replaced for the machine to perform efficiently. Not doing so will damper the performance of the engine and overwork your Forklift. FORKLIFT MAST PARTS The mast is made up of individual pieces and parts, some require more care and attention than others. To keep your lift truck operating at peak performance, each individual part from the mast rollers to the lift chain needs to work in tandem. One or more of these parts wearing down or becoming uneven can result in accidents. Be aware of the most common warning signs from your mast. If you hear grinding sounds, see metal on metal scraping marks, you may need to replace your rollers and bearings. Need Parts?? Let Robs Forklift handle that! Call or email our Parts Manager Allen Watson for your Forklift Parts needs and inquiries. A falling object protective structure (FOPS) most commonly called an OverHead Guard, is designed to deflect or absorb the impact of falling objects or debris. They are a very important safety device and are required on all high lift trucks. It must be clearly understood that the guards capacity is limited, they are not rated to the trucks capacity, a 5000lb capacity truck overhead guard cannot stop 5000lb and protect the operator. As part of the daily inspection of a forklift, check the overhead guard for broken welds, missing bolts or other damage. While we are on the subject of overhead guards, lets talk about a couple other important safety rules regarding them. Living in the lower mainland we are subject to long months of rain and operators are always putting something over top of the guards to protect them from getting wet. I have seen everything from cardboard to saran wrap. This is not allowed as you are obstructing your view and line of site when conducting high lifts. The only thing allowed is plexiglass as it is clear, but keep in mind that you must keep it clean at all times. Over head guards and rollovers…yes these machines can rollover if not driven safely and properly. Operators have been injured and even killed by the guard in rollover accidents, human instinct in this situation is to jump/get out of the machine, but you are jumping out the same way its rolling and have the potential for the guard itself to hit or crush you. In a rollover situation..STAY IN THE MACHINE! Hopefully you have your seatbelt on, even if you don’t, position your hands on top of the steering wheel, head down, and brace yourself the opposite way of the roll. You may walk away with a head or shoulder injury but you are walking away. Many work places in the Vancouver area use ramps as a tool for loading and unloading trucks and trailers. Lets take a look at the safe and proper way that forklifts must travel on ramps and grades. Potential Hazards: There is a danger of tipover when traveling on ramps and grades. Requirements and Recommended Practices: Always look in the direction of travel. Never turn on a ramp or incline. Turn prior to the ramp or incline to place forks in proper direction. Keep a safe distance from the edge of a ramp. Do not travel on ramps with slopes or other conditions that exceed the manufacturer’s recommendation. Figure 2. Traveling down ramp without load. Traveling With a Load (Forks Upgrade) Forklift operators should be aware of procedures to follow when traveling on ramps and other inclines with a load. Potential Hazards: Danger of tipover. Danger of losing load. Figure 3. Traveling with a load. Note that ramps should have railings or bull rails. Figure 4. Traveling up ramp with load. Figure 5. Traveling down ramp with a load. Requirements and Recommended Practices: When traveling with a load, the load should point up the incline, regardless of direction of travel. Going up the incline: Drive forward. Forks pointed upgrade. Use a spotter if load blocks the driver’s view. Going down the incline: Drive in reverse. Turn head and face downgrade. Forks pointed up the grade. NOTE: When walking with a pallet truck with or without a load, the forks should be pointed downgrade, regardless of direction of travel. Traveling Empty (Forks Downgrade) Forklift operators should follow certain procedures when traveling on ramps and grades without a load. Potential Hazards: Danger of tipover. Figure 6. Traveling without a load. Note that ramps should have railings or bull rails. Figure 7. Traveling down ramp without load. Requirements and Recommended Practices: When traveling without a load, the forks should point downgrade, regardless of direction of travel. Going up the incline: Drive in reverse. Turn head and face upgrade. Forks pointed downgrade. Going down the incline: Drive forward. Forks pointed downgrade. Scissor Lifts can be a serious hazard when are not maintained properly In 2004, a scissor lift being operated on a new concrete floor of a tilt-up building under construction fell over without warning when the operator lowered the lift slightly to clear a steel joist and proceeded to drive backwards. The scissor lift hit an adjacent steel column on its way down, with enough force to bend the guardrails on the platform. The worker managed to jump out of the lift before it hit the ground, and suffered only minor injuries. The scissor lift was a Marklift J25 EP unit with a capacity of 800 pounds and a maximum extension of 25 feet. It fell over because the left front steering arm, to which the left front wheel was mounted, had separated from the scissor lift chassis. The steering arm and steering-arm spindle are welded together, forming a complete unit. The steering-arm spindle had broken into two pieces, and the steering arm and wheel had fallen away from the chassis. As a result of the sudden loss of support at one corner of the chassis, the scissor lift toppled over. How Can You Tell Apart Different Types Of Forklifts? Counterbalance Forklifts Counterbalance forklifts are probably the most common forklift trucks used in indoor warehouses and stores. Their operation is straightforward. They have dual forks at the front of the truck and a weight in the back to offset the weight of the load in the front. They are available in electric, propane, or diesel. Typical day for a forklift driver As a forklift operator, you will be expected to move resources around storage areas, warehouses, factories, construction and work sites. The machine is equipped with a fork to grab heavy objects and a hydraulic lifting mechanism. 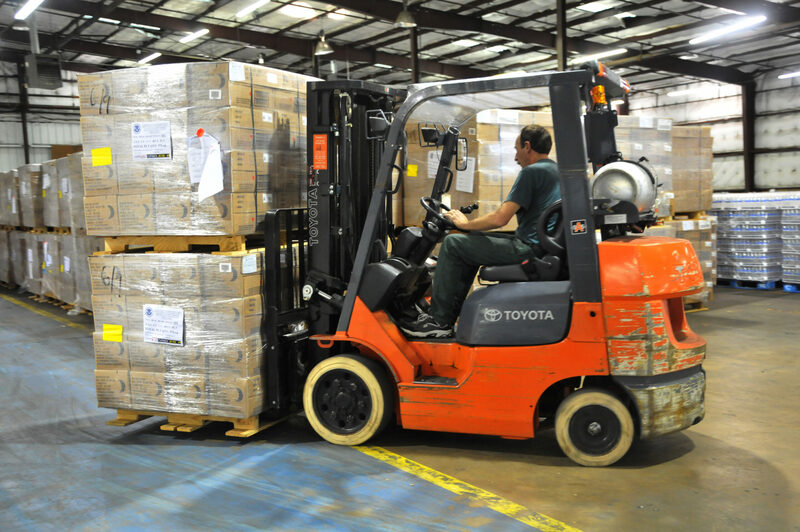 Forklifts are used in the warehouses on a daily basis and require frequent inspections. These checks will ensure the right quality of your equipment and protect the operator. The best way to reduce the risk of forklift accidents is to make sure that your workers have proper forklift training. However, once you get your certification, it’s important to stick to these tips to avoid forklift accidents.